Blend all the ingredients to make the paste. Add 2-3 teaspoons of water if needed. Take a pan and heat oil. Add paste and stir it for 3-4 times. Add fenugreek leaves and half cup of water. Cook it for 3-4 minutes. 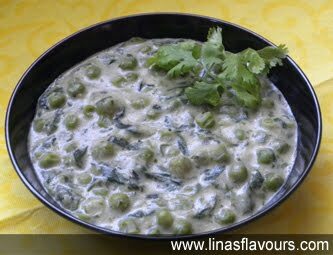 Add peas, milk, cream and dry masala. Mix it well. Let it simmer for 5-7 minutes. Serve it hot with roti, parathas or nan.